Learn five classic blues songs, especially arranged for intermediate-level guitarists who want to explore exciting new styles and repertoire. 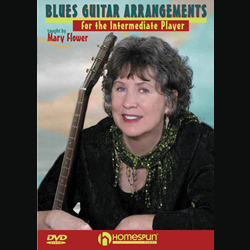 Mary Flower’s clear, step-by-step instruction will make these pieces fun to play for anyone with some prior knowledge of blues fingerpicking technique. Mary starts off with Leroy Carr’s Papa’s on the Housetop, first strumming the basic chords to get you quickly into the tune. She teaches you how to play the melody on the high strings, then adds harmony notes and finally finishes the arrangement with a hot New Orleans bass line. She then launches into equally detailed instruction for Bessie Smith’s Backwater Blues, with moving basses and unusual harmonies; Memphie Minnie’s Black Rat Swing, played in both standard and open D tunings, Jimmy Oden’s Going Down Slow, a 12 bar shuffle/groove blues, using “a combination of Charlie Pattone and Jimi Hendrix licks” and New Orleans Hop Scop Blues, another great Bessie Smith ragtime blues. Mary’s arrangements are challenging, fun to play and filled with musical ideas that will inspire you and add great songs to your repertoire.